Optional Single Supplement: $877 USD (number of singles limited). This classic combo of two of our favourite destinations features the best highlights of Western Turkey and Istanbul, and the idyllic and surprisingly varied Greek Islands of Rhodes, Santorini and Mykonos. This well-paced itinerary strikes the perfect balance of organized activities and touring and individual downtime to explore and soak it all in. Ancient cities, sprawling archaeological sites, rugged coastlines, impossibly blue waters and sugar white beaches, this tour has it all - breathtaking monuments, varied cultures, compelling history, stunning landscapes, and fascinating legends. This morning we visit the Topkapi Palace, the great palace of the Ottoman sultans from the mid-15th to the early 19th century. It was from this vast complex of buildings that the mighty Ottoman Empire was administered. Today it is a huge museum containing ceremonial robes in silk and gold thread, Japanese and Chinese porcelain, European clocks, miniature paintings depicting Ottoman courtly life, and one of the largest jewelry collections in the world. Highlights of the jewelry collection include one of the world's largest diamonds, the Spoonmakers diamond, and the Topkapi dagger with three enormous emeralds in the handle. The afternoon is free for you to explore Istanbul, a city crowded with beautiful mosques, churches and palaces. You may want to visit the Topkapi Harem before leaving the palace. Perhaps stroll down to the Spice Bazaar (Egyptian Bazaar), where spices, dried fruits, cheeses, sausages, jams, nuts, lokum (Turkish Delight) and other edibles fill many of the shops. This bazaar is located right at the southern end of the Galata Bridge on the Golden Horn in the Eminönü district, right next to the New Mosque (Yeni Cami). Alternatively, you may take an optional ferry ride up the Bosphorous towards the Black Sea. 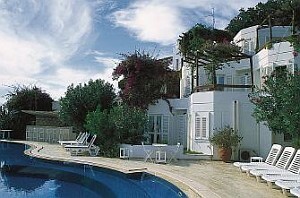 Along the shores of the Bosphorous are many summer palaces and old wooden houses dating from Ottoman times. Your Tour Leader will help you plan your day. Today we fly to Kayseri, gateway to Cappadocia. Upon arrival in Kayseri we continue by road (1.5 hours) to Cappadocia. 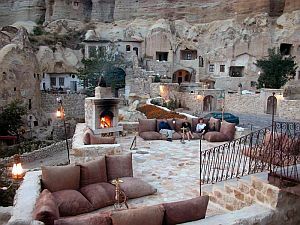 Situated on a high and dry plateau in the middle of Turkey, the rocky landscape of the Cappadocia region is honeycombed with a networksof ancient underground settlements and outstanding examples of Byzantine art. Today we drive across the flat Anatolian Plateau to Konya. The plateau-like, semiarid highlands of Anatolia are considered the heartland of the country. Mountains near the coast prevent Mediterranean influences from extending inland, giving the interior of Turkey a continental climate with distinct seasons. Along the way we visit the Sultan Han (Caravanserai of Sultanhani). Caravanserai were fortified, medieval hotels located one day's journey apart. 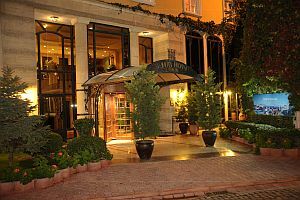 The Turks built these hotels and offered free accommodation and protection to travelling merchants. This encouraged merchants and their caravans of silks and spices travelling the "Silk Route" to trade in Turkish lands, thus fostering prosperity. Konya was the centre of Sultanate of Rum from AD 1150 until 1300. Many of the great buildings of Konya are Seljuk in design and date from this 'Golden Age'. We will see the Mevlana Museum, the ruins of the Seljuk Palace, the delicate stone carving of the Slender Minaret, and the Karatay Museum. The highlight of our journey to Konya will be a visit to the Mevlana Museum, a tribute to the founder of the whirling dervishes. This morning we continue by road to Pamukkale, unique with its fairylike, dazzling white, lime cascades, known as 'travertines.' Here we will see the thermal spring water laden with calcareous salt, plunging down the mountainside, which has created this natural formation of stalactites, cataracts and basins. 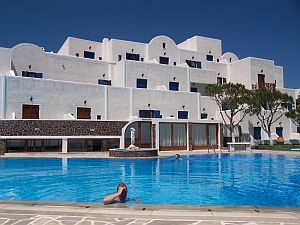 The thermal water has been used since the Roman period for its therapeutic powers. 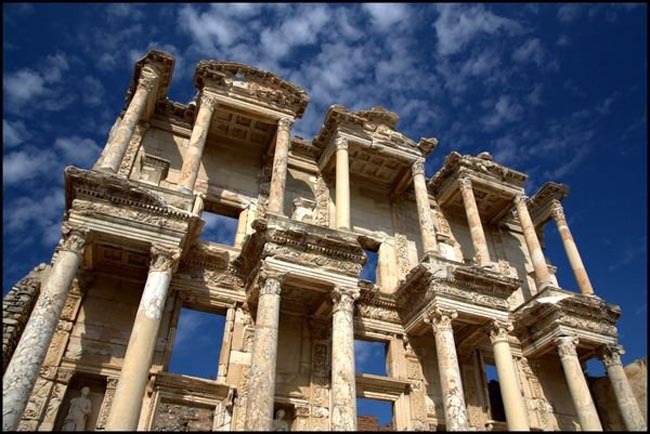 Next we will visit the Roman city of Hierapolis. The ancient Greco-Roman and Byzantine city of Hierapolis was built on top of the white "castle". Hierapolis, whose name means "sacred city," was believed by the ancients to have been founded by the god Apollo. It was famed for its sacred hot springs, whose vapors were associated with Pluto, god of the underworld. The city also had a significant Jewish community and was mentioned by Paul in his Letter to Colossians. Today Hierapolis is a UNESCO World Heritage Site. Most of what we see today is from the Roman period, as the original Hellenistic city was destroyed by successive earthquakes. The site is surrounded by Byzantine walls, outside of which is an extensive necropolis which we will also visit. The north necropolis (graveyard) is the largest in Anatolia! It contains more than 1,200 tombs of various types, including tumuli, sarcophagi and house-shaped tombs from the Hellenistic, Roman and early Christian periods. This morning we travel along the winding Menderes River Valley, which gives its name to the geographical term "to meander". 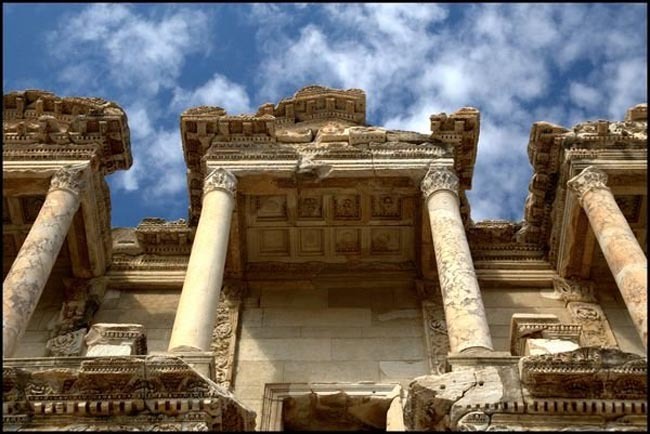 We will visit the impressive Roman archaeology site of Aphrodisias, named after Aphrodite, the Greek goddess of love. Much of the site's excavation has been funded by the National Geographic Society. Aphrodisias is the location of one of the greatest schools of sculpture in antiquity; the museum here contains some magnificent pieces. 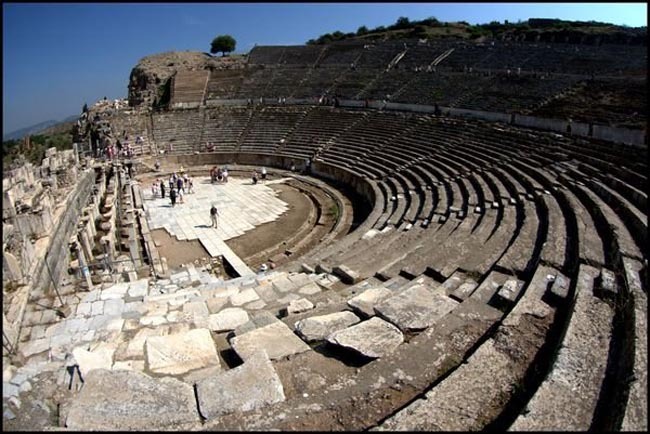 Here we will see an ancient stadium where 30,000 people could watch sporting events. We will also view the Temple of Aphrodite, which was later converted to a Christian basilica; and the theatre and baths of Hadrian. We continue to the coast once again to Kusadasi, our base for our excursion to Ephesus. Today we travel down the coast to Marmaris from where we take the ferry to Rhodes, Greece. Marmaris's situation, with pine forests reaching right down to the sea, has been described as fjord-like for the huge bay in which it sits is almost landlocked. Nelson's entire fleet sheltered in this anchorage in 1798 prior to sailing for Egypt where it destroyed the French fleet in the Battle of the Nile. 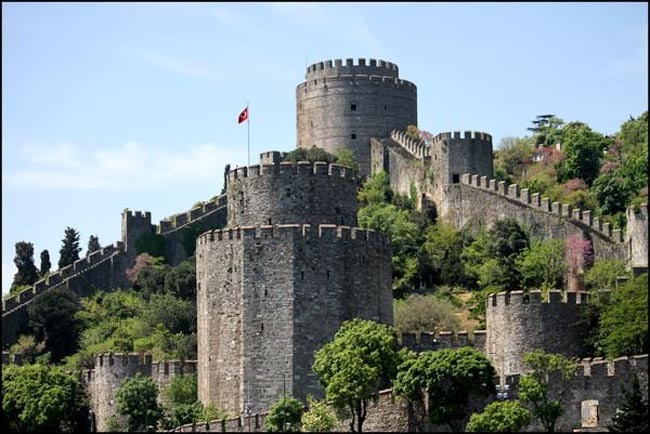 In the old quarter on a hillock jutting out into the bay stand the remains of an Ottoman castle built in 1522 by Suleyman the Magnificent, with a cluster of crumbling houses roofed in red tiles huddled within its walls. Our ferry will likely be a hydrofoil and, weather depending, the journey takes approximately one hour. Welcome to Greece! The order and placement of our sightseeing on Rhodes (dependant on ferry time and duration, and flight time to Santorini), will be at the prerogative of your Tour Leader. 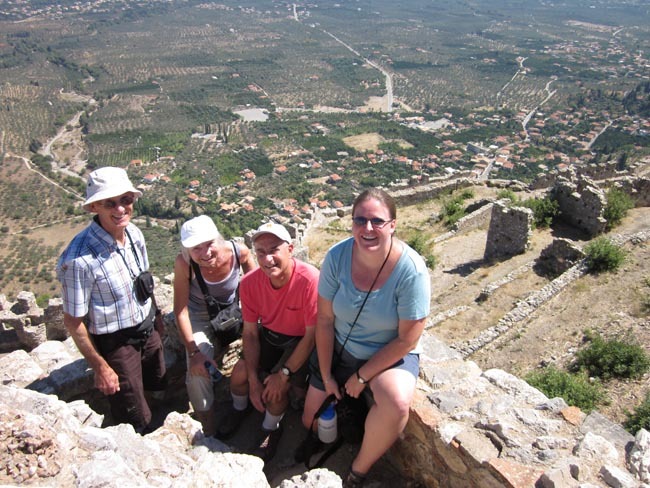 During our time on Rhodes we will have a walking tour of the old town. Today we will visit the Castle (aka Palace of Grand Masters), which features turreted towers as perfect as they were back in the 14th century. Destroyed when an arms store in the nearby Church of St. John exploded in 1856, it was rebuilt by the Italians and was the summer retreat of King Victor Emmanuel and Mussolini. The Knights of St John was a religious order of the church of Rome founded in Amalfi in the 11th century. They went to Jerusalem initially to minister to the needs of the pilgrims who arrived there and soon extended their duties to tending the poor and sick of the Holy Land. Over the years they became increasingly militant, joining forces with the Knights Templars and the Teutonic Knights of St Mary in battles against infidels. We then head out of town by bus, stopping at Lindos to visit the Acropolis and to have a wander about this lively village, a unique monument of preservation. The beauty of the castle, the Acropolis of Athena Lindia on the top, with St. Paul's Bay (where the Apostle arrived in 58 AD) and the paved streets of the village captivate visitors. A walk through its narrow paved streets reveals the beauty of the traditional island architecture. On the way back to Rhodos we drive across the island from east to west coast, passing through villages and densely wooded areas. We reach the top of Filerimos Mountain, with its marvellous panoramic view. We then come to the ruins of the acropolis of the ancient Lalussos where we have one of the best panoramic views of Ixia, one of the biggest tourist resorts in Rhodes. We return to Rhodes town mid-late afternoon. 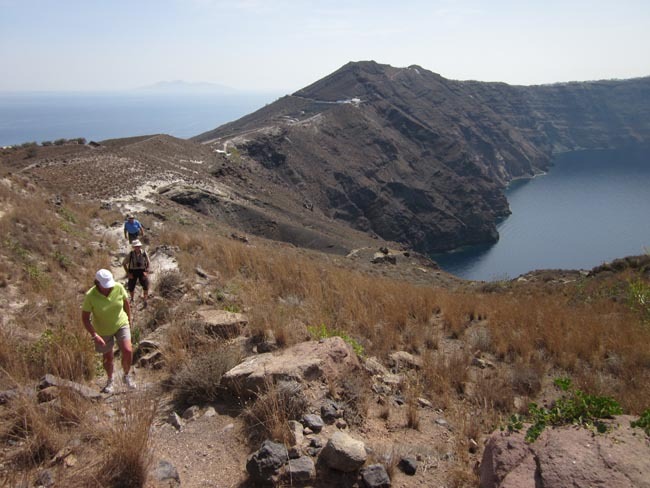 On arrival we transfer to our hotel near Fira on the caldera rim. 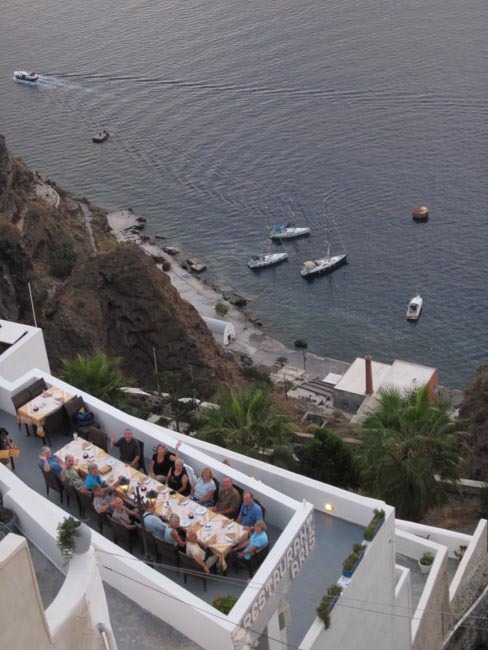 * Our dates are set to coincide with direct flights to Santorini, which occur only on certain days of the week. In the event of a schedule change, we may have to fly via Athens. We begin with a visit to Akrotiri, where excavations have revealed a complete prehistoric Minoan city with squares, streets and two-storey houses, which contained marvelous frescoes. The buildings date to the late 16th century BC. No skeletons or treasures have been found in Akrotiri, so historians think that the inhabitants were forewarned of the eruption and were able to escape. The excavations have yielded evidence that has revolutionized our knowledge of the Late Bronze Age; indeed the town has been called a "Bronze-age Pompeii." 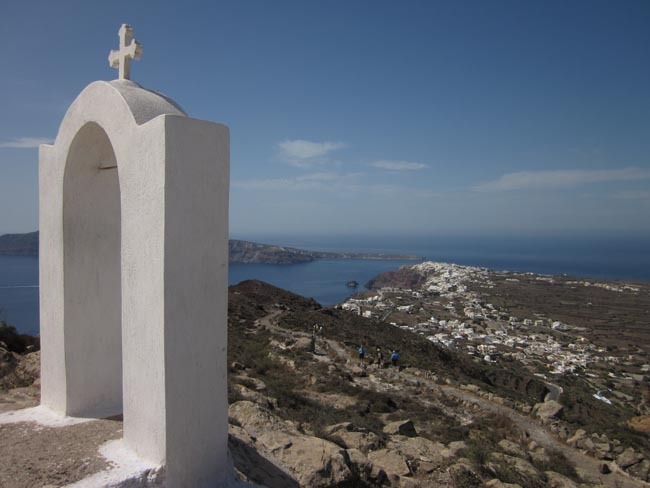 Fira is the capital of the island and the most important village. Perched on the edge of an impressive cliff 260m high, the town offers great panoramic views over the submerged volcano. Here the small streets are filled with all kind of shops, cafes, and restaurants. After an orientation walk through the town we will visit the impressive Archaeological Museum. 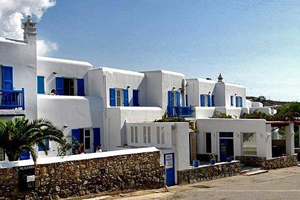 This museum features many pieces and exhibits specific to the Santorini site of Akrotiri, as well as artifacts dating back to the time of the Cycladic Civilization. The most impressive legacies of this civilization are the statuettes carved from Parian marble -- the famous Cycladic figurines. Like statuettes of Neolithic times they depicted images of the Great Mother. Other remains include bronze and obsidian tools and weapons, gold jewelry, and stone and clay vases and pots. 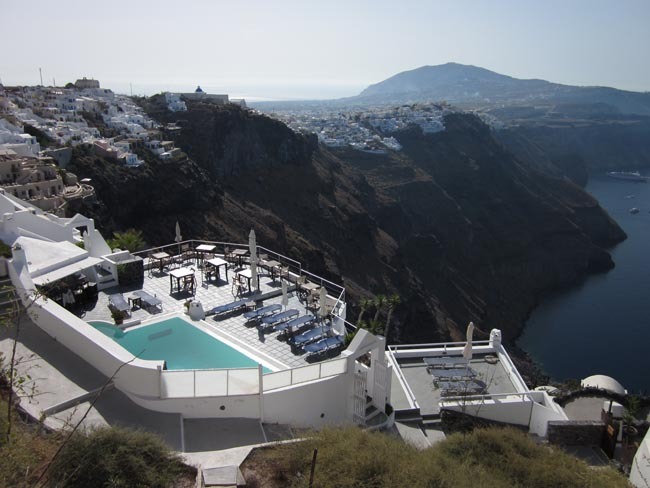 Oia, our last destination, is built along the rim of the caldera wall. We will walk through the village, admire the magnificent panoramic views, and perhaps enjoy a snack at one of the many local cafes. 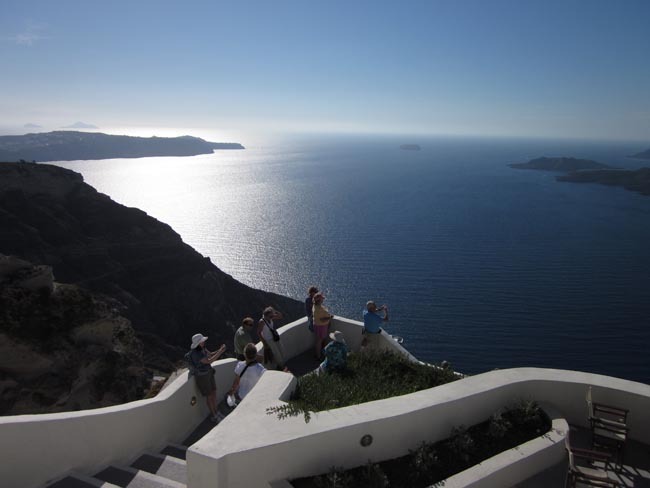 We then return to Fira. 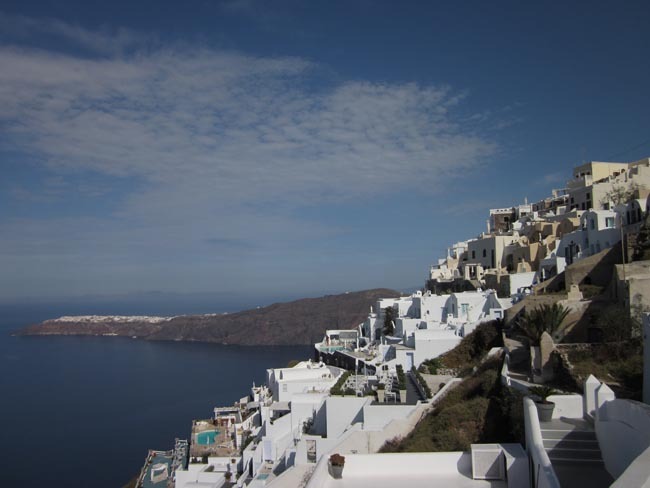 Those who wish to extend their time in Oia can return to Fira using the public bus system. Today we travel by ferry to Pireaus, the main port of Athens. Depending on ferry schedules, we may have extra time in either Mykonos or Athens. 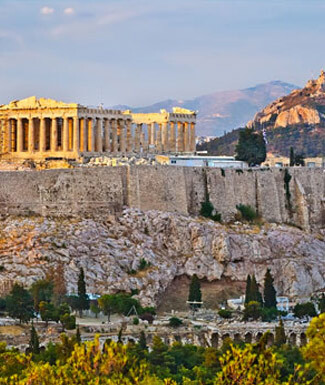 Athens has been, off-and-on, the capital of Greece in its many incarnations over several thousand years. 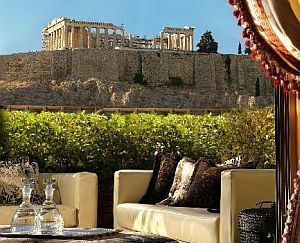 The city received a major facelift for the 2004 Olympics and is looking better than ever, with buildings and monuments cleaned and renovated, and newly created pedestrian areas near the Ancient Agora and Acropolis. Today we will travel by road from Athens to Delphi. On arrival we will have a guided tour of this spectacular site and its excellent museum. Return to Athens in the late afternoon. 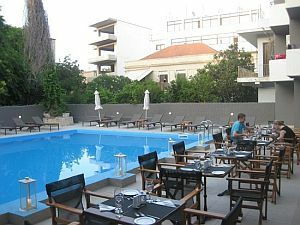 This low-key, 5-story hotel is a 9-minute walk from the Palace of the Grand Master of the Knights of Rhodes ...	a 12-minute walk from the Archaeological Museum of Rhodes. Breakfast and dinner (mostly local restaurants, some hotels) daily. All accommodation, sightseeing and entrance fees for sites noted as 'visited' in the detailed itinerary. 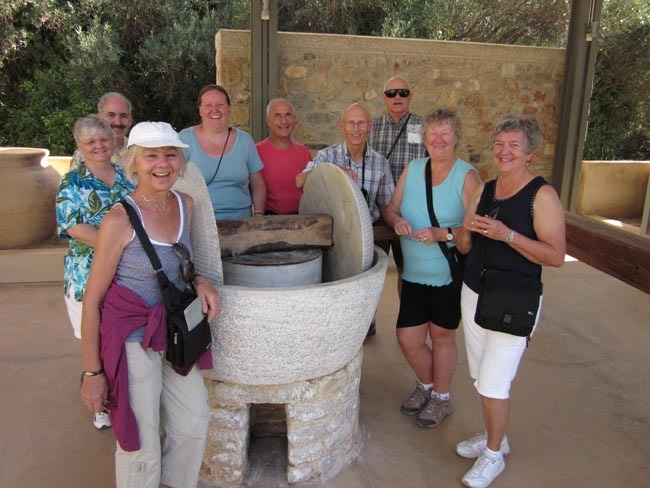 Gratuities for local guides, drivers, restaurant staff, porters (where available). Airport transfers for land & air customers and for early arriving / late departing land & air customers who book their extra hotel nights through us. International airfare to/from the tour. Tour Leader gratuities, lunches, drinks, personal items (phone, laundry, etc), international (if applicable) and domestic air taxes, visa fees / port taxes, and excursions referenced as 'optional'. Airport transfers for Land Only customers. Our post-reservation trip notes offer further guidance on optional meal costs, shopping, and visas. This tour is offered in spring, summer, and fall, the most popular being spring and fall when temperatures are milder, crowds thinner, and airfares lower. Spring is popular for green landscapes and wildflowers; beach goers prefer fall sea temperatures. The region has a Mediterranean climate with early springs, long hot and dry summers, and autumns that are bright and warm into mid-October. Showers are possible in spring, rare in summer, and possible in fall. Local ferries between mainland / islands can range from hydrofoils to large vehicular vessels (economy class). Greek ferry schedules tend to change without notice; some itinerary adjustments may be necessary at the discretion of your Tour Leader. Land transport by private air-conditioned motor coach, 24-36 seats depending on group size (see "Group Size"); some local buses and taxis. Turkish roads are very good and travelling is not arduous though we do have some full days. Scheduled flight Rhodes to Santorini. Several walking tours on uneven surfaces. Porters are available at all hotels in Turkey; however, they are generally NOT available at hotels on the islands. Your MUST be able to manage with your own baggage at airports and onto / off ferries. Well-located, air-conditioned, mid-range hotels (3-4 star) throughout. Island hotels are smaller properties (3-4 story) that will likely not have elevators. All hotels have en suite bath, though most have shower only.